The organic vineyards at Salcheto in Montepulciano. The photo's here because tank photos, even of unique tanks, are ugly. Now that this has been named Best Industry Blog, I guess I'd better earn it. Salcheto Winery in Montepulciano, Italy has an interesting new fermentation system that co-owner and winemaker Michele Manelli says was developed specifically for them. The goal is softer tannins and more extraction. Take a look at the tank at right. The two holes lead to separate chambers. 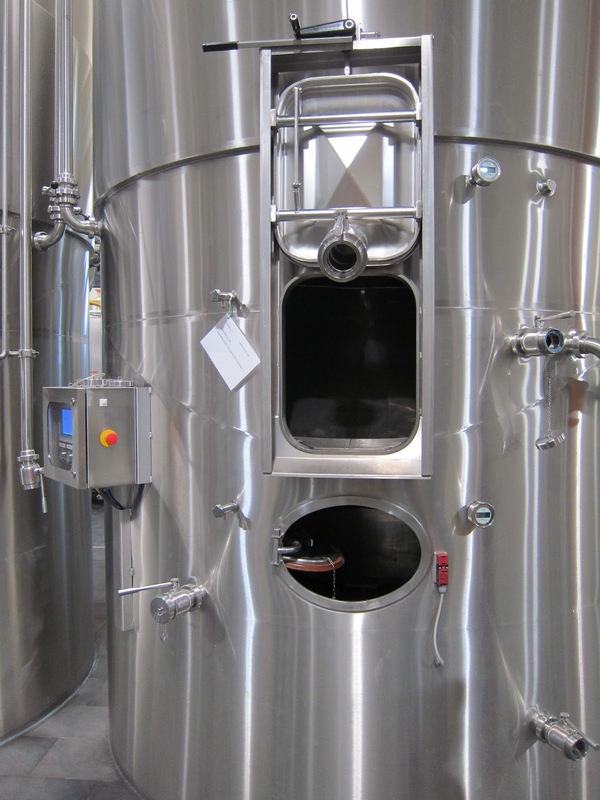 On top is a normal closed-tank fermentation system: grapes go in, and as the yeast converts sugar into alcohol, CO2 is created as a byproduct. What this new system does is collect the CO2 at the top of the tank and pump it to the smaller chamber below, where it is stored until Manelli decides it's time to break up the "cap" of floating grapeskins. Then he releases the CO2 from valves into the main tank, where it bubbles up gently through the cap. Thanks to reader Joel DeGonia to pointing out that this system has been on sale in Italy for a while. Here's a brochure. Note the industrial size of the tanks in the brochure. The one I saw at Salcheto was probably about 20 feet high. So is this megawinery-designed technology scaled down? The reuse of CO2 fits neatly with the environmental/technical philosophy of Salcheto, a 15,000 case winery that seems concerned with high-tech sustainability at every step. The vineyards are certified organic. Every part of the winery, even the basement, is lit by natural light brought from the surface through a system of pipes with mirrors in them. There's a thriving green wall of plants on one side of the winery to reduce heating costs. It's an impressive place. As for the new technique itself, I'm sure there are California wineries that would be interested in a visit. I think it's too early to tell how it will affect the wines. I found the winery's 2009 Vino Nobile di Montepulciano too tannic, which the new system is designed to address. The 2006 "Salco Evoluzione" is quite ripe and seems targeted for fans of big Super Tuscans, but also was held back by oppressive tannins. Presumably this system will advance its, er, evoluzione. Similar systems have been in use in CA for quite some time, but with a few slight changes. One I'm familiar with captured the CO2, which was then used to pump the juice pack over the cap instead of using a pump to do the same task. It did a pretty good job, and I found the lots produced with this method produced a softer, slightly fruitier final product. Based on what you've described, it almost sounds as if they're using the CO2 in the same way that folks use O2 in microoxygenation set ups. I could be wrong, and I'm sure someone will correct me, but that's what it appears to be doing. If that is the case, micro-ox has been shown to soften wines at a much faster rate by creating a higher percentage of polymeric pigments, or 'colored tannins', that have a much lower affinity to binding to salivary proteins, or creating the sensation of 'astringency' . . . In any event, thanks for posting - and congrats on the award! And let me know next time you are up in the Santa Ynez Valley - would love to put a face with a blog! Larry: That's what I thought too, that it sounds like micro-ox. The guy at Salcheta said CO2 and O2 react differently with tannins. I'd need somebody with greater knowledge of chemistry than me to comment. Joel DeGonia tells me the tanks are used with whole berry fermentation for Pinot Noir because they help dislodge the seeds. Re face with the blog: Too early to panic, but the lenses on my signature red glasses appear to need replacement. So I may be able to walk by you in plain sight. But I will introduce myself. I like the Santa Ynez Valley, usually try to visit at least once a year. Tanks that use CO2 generation to produce a "continuous pumpover" have been in use for decades, predominantly in Portugal IIRC. The only "innovation" here is using the CO2 from fermentation to break up the cap less frequently and at will. Whether or not this producer's Montepulciano will end up less tannic depends entirely on why it was so tannic in the first place. If the harsh tannins were simply the result of over-manipulation of the cap, then the answer is probably yes. The downside to any closed tank red fermentation is the chance for stressed fermentation and reduction due to starving the ferment of oxygen. 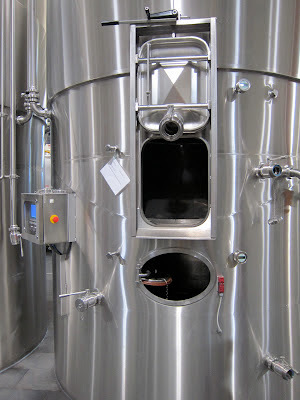 IMO there are more effective, cheaper ways to address the problem in the winery (assuming the tannin issue doesn't start in the vineyard); the simplest would be to to at least one delestage several days into the ferment, and remove most of the seeds from the bottom of the fermenter during this manipulation. Much as I'd take any excuse to visit Italy, going to see this system would not be one of them. This is a classic case of pointless scaling down of a technology that was designed to address a need in an industrial winery. I can come up with ten better uses for the scarce capital available to most small wineries in about as many seconds. Follow up for the first two comments: No, CO2 will not soften the tannins they way O2 does. CO2 does not participate in any chemistry with the phenolic precursors. While introducing O2 during fermentation is a fairly common practice, and one that does result in somewhat softer tannins in my experience, that is not the same thing as micro-ox. Micro-ox is a process applied to a pressed, mostly finished wine, in tank. Oxygen is bubbled into the bottom of the time so slowly and so finely that bubbles never reach the surface. John: The Salcheto guy said that they were motivated to use this because of how gentle the bubbles are as opposed to push-downs. But I think the idea of reusing the CO2 appealed to him. They even reuse light. Re excuse to go to Italy: good cappucino for breakfast? Selection of amaros after dinner?